Aqua Audit will assess your building’s entire water situation and prevent your money from going down the drain. We go beyond just reading water meters and are well-versed in all aspects of NYC regulations and billing methods. We know what to look for and how to advocate on your behalf. Here are some of the ways we help save clients money. The following information provides more detail about each of these services. DEP has become more vigilant in their inspections and building owners are subject to violations resulting in costly fines up to $1,000.00 per device. Contact AquaAudit to add your device(s) to our annual testing schedule. Upon completion of the test, AquaAudit will place a hang-tag on your device, submit an original GEN-215B form to DEP verifying compliance and provide you with a copy for your records. We offer guaranteed annual pricing and notify you with automatic reminders 2 months prior to each scheduled test. 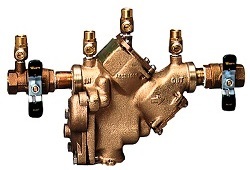 Learn more about our Backflow Testing and Installation. At present, there are two ways that DEP charges a building for its water usage: Frontage and Metered-Billing. Frontage is a flat rate, paid annually to the city every July 1 and is based on the size of the building, number of units and the amount of water fixtures. Metered-Billing is paid quarterly and is based solely on consumption or the actual usage that passes through and registers on the building’s Entire Premise meter. Our Frontage vs. Metered-Billing analysis program was created to inform clients as to the most cost-effective method of payment for a building’s water and sewer use. This is an important consideration, because when a building switches from frontage assessment to metered-billing, the move is final. For that reason, it is critical that our clients understand the potential costs or savings before making a final decision. Upon determining there is a significant enough savings to warrant the billing conversion, AquaAudit will file the required DEP applications, meet with the DEP Inspector at the premises and monitor the meter readings to ensure the transition is seamless. If there is a change in your building’s ownership, you’ll need a final reading at the closing. If the DEP is not scheduled in advance, they may not be able to accommodate your need for that day, forcing you to postpone closing and incur additional cost and inconvenience. That’s where AquaAudit’s meter reading division can help. With a simple phone call, we will provide a same-day read so your closing can take place without the inconvenience and cost of a delay. Take action now to avoid receiving a DEP compliance letter that only allows you 30 days to complete this process. For more information or expert help on any of these services contact us.